Agents with the FBI visited the offices of LA Unified headquarters yesterday and seized files related to the district’s controversial $1.3 billion iPad program, a district spokesman confirmed. The FBI action was first reported by the Los Angeles Times, which said 20 boxes of documents were removed and that the seizure came as a complete surprise to district officials. The controversial iPad program, which aimed to give every student and teacher in LA Unified an iPad as part of the Common Core Technology Project, was one of the major initiatives undertaken by former Superintendent John Deasy, who resigned in October. Some critics who opposed the iPad program from the start questioned whether bond money was an appropriate or even legal way to fund the purchase of iPads, although the district’s lawyers determined it was legal and the program was approved the district’s bond oversight committee. While unanimously approved by the LA Unified school board in 2013, the board pulled back on its support for the iPad program as its implementation was fumbled and questions were raised about the fairness of the bidding process. Deasy cancelled the iPad program in August after emails surfaced showing he and a deputy had a close relationship with Apple and Pearson, a company that provided educational software for the iPads. To some it looked like the bid was rigged favor of Apple and Pearson. 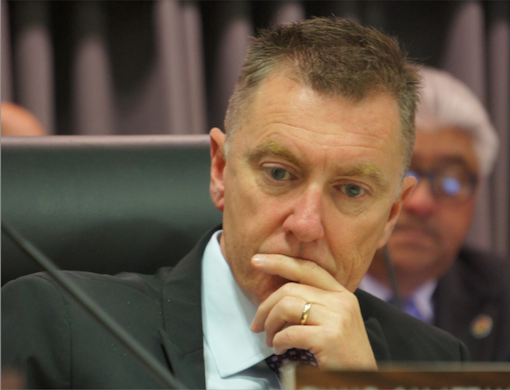 Deasy’s resignation is believed to have come under pressure from the board, in part as a result of the botched iPad program, although the board issued a statement that said it believed the results of a report would show Deasy did not break the law. “While the District’s investigation into the Common Core Technology Project has not concluded, the Board wishes to state that at this time, it does not believe that the Superintendent engaged in any ethical violations or unlawful acts, and the Board anticipates that the Inspector General’s report will confirm this,” the statement said. Deasy was replaced by interim Superintendent Ramon Cortines, who told the Los Angeles Times that the FBI raid came as a surprise.